From the Etsy description: "Frost Fairies - My favorite, and probably the most difficult to photograph. 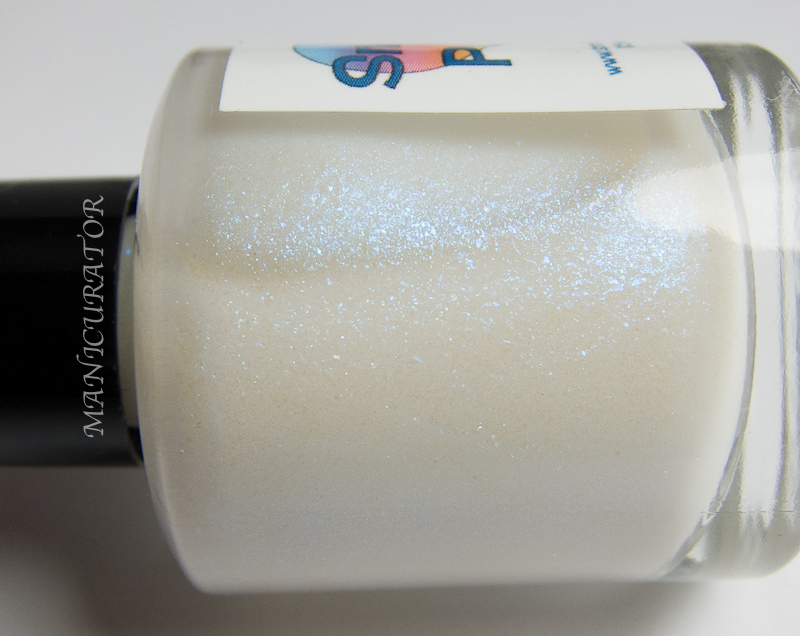 This is a semi-sheer white jelly base with blue and aqua shimmer." I used 3 easy coats here. A beautiful clean but not boring polish! 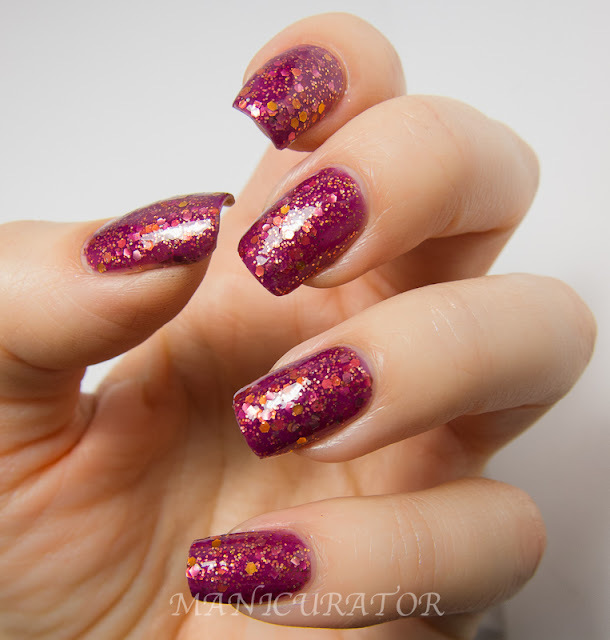 From the Etsy description: "Merry and Bright - Inspired by Victorian Christmas cards, this is a muted berry jelly base packed with various sizes and shapes of copper and gold glitters." Beautiful. Application was ok, a little thick, but not troublesome. I've got 2 coats on here. 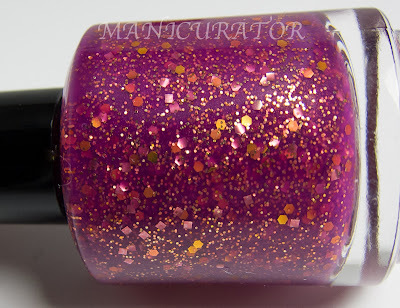 All swatches have one coat of HK Girl top coat. From the Etsy description: "Spice Cake is several size of orange, gold and brown glitters suspended in an orangey base" This is actually from the Halloween Collection not the Holiday Collection. 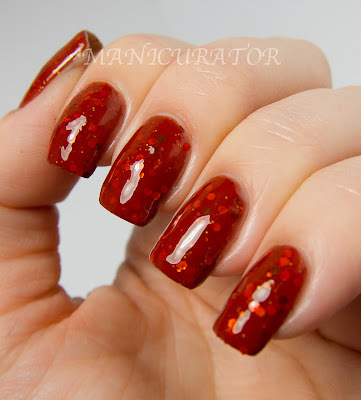 This one, as pretty as it is, and unique in it's color and glitter combo, was difficult to apply. 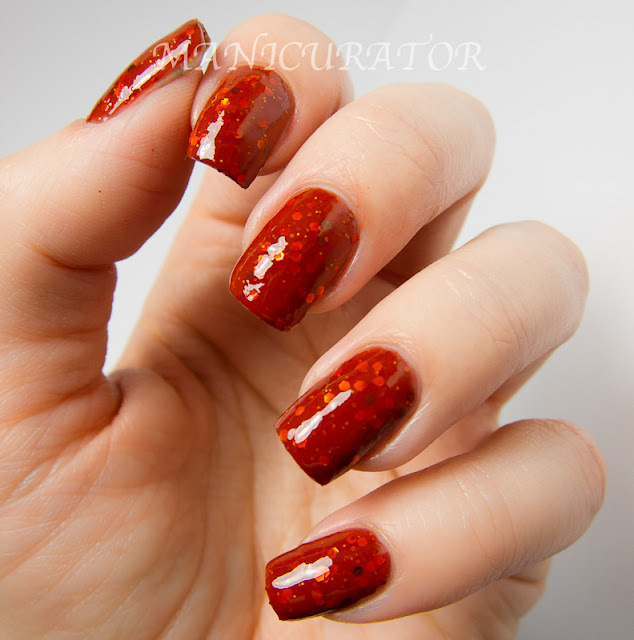 I have found this happening before with Indie made highly pigmented jellies. I needed 3 coats to achieve a uniform coverage and it got a bit gloopy. Still worth it in my opinion, but not my favorite as far as application goes. 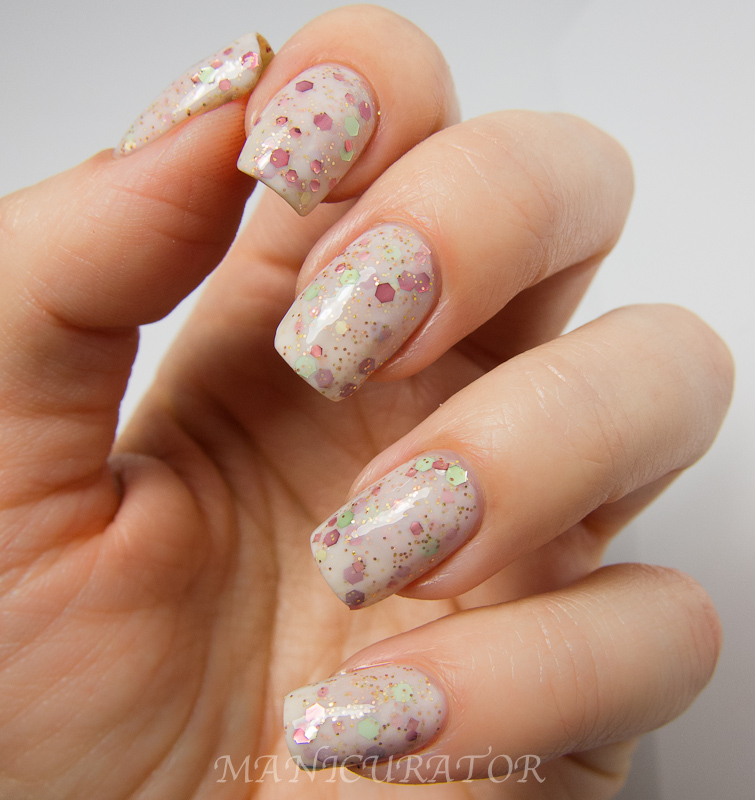 From the Etsy description: "Adeste Fidelis - White jelly base with rose, pale green and coppery glitters. I was 12 years old the first time I saw Pavarotti on PBS singing Adeste Fidelis at Notre Dame Cathedral in Montreal. That image has stuck with me my entire life, and the opulent interior of Notre Dame served as the inspiration for this combination of colors." That is fantastic that they match. I love those ornaments btw. Macy's? Oh my gosh! Adeste Fidelis is absolutely gorgeous - I hope she re-opens soon so I can snag a bottle! I must say you should have a Q&A section! I am just wondering, and I do not mean to insult! Are your nails real? Do you paint them this many times just to test and then remove it or do you wear it for a few days? I read above you kept it on for a full 24 hours and that's rare. I find the more I use nail polish remover the more my nails break, split or are just weak. Oh CarlyJo, I'm sure I couldn't keep up with a real Q&A :P But I'm happy to answer any question you have! Yes my nails are completely natural! And yes, for the most part I paint "swatches" to review based on application, formula, coverage but not wear time. It's a shame!! I'd like to be able to report on that aspect too, and would love to be able to wear and enjoy the ones I love more often. 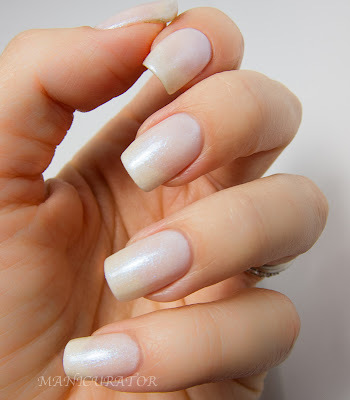 I have found the Zoya Remove to do a great job, and not be too damaging. I'm also mindful of washing off the remover with mild soap and water. And lastly, I soak my nails in (EV olive oil) as frequently as I can and find that has cut down on splits and breaks! Merry and Bright is Ah. Maz. Ing. Wow!!! These nail polishes are so gorgeous! They all look so elegant and classy. They are perfect for any occasion. Merry and Bright and Adeste Fidelis are both *amazeballs*!! 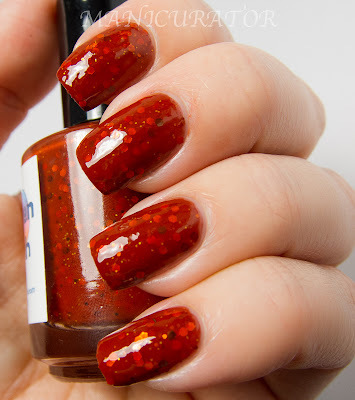 I think these are my favourite Smitten polishes I've seen...ever! Frost Fairies reminds me of piCture pOlish White Wedding and Girly Bits January Morning. The shimmer and tone might be slightly different though. They look lovely! The frost fairy looks so snowy I love that.